You can very effectively protect your network from active attack with Network Address Translation or NAT. You assign your internal addresses from one or more of the reserved blocks defined in RFC 1918 — 10/8, 172.16/12, and 192.168/16. Those represent 16,277,216, 1,048,576, and 65,536 possible IPv4 addresses, respectively. You then configure one or more border routers to do what's called IP masquerading, each hiding all the internal addresses behind one or more external IP addresses used by the exterior port of the router. How can you get away with telling lies? Make certain that your lie is somewhat plausible. Above all, make certain that you are consistent in your lying. Network Address Translation (or IP masquerading) is a form of lying. It's something that firewalls, or routers in general, can do with the IP addresses in headers of packets they forward. The result is that details of the interior network are hidden, because the device doing NAT is effectively lying, masquerading as though it simultaneously was all of the hosts inside the networks it is hiding. To distant servers, your entire organization looks like one extremely busy host. Well, that's how you see it from your house. Using my connection as an example, the reality is a bit more detailed. For an explanation of IP addresses, the slash notation, CIDR blocks and more, see my TCP/IP page. Now, if you find your PC's IP addressing, using the commands described on my page of TCP/IP commands, we can add network addresses to the diagram, as seen below. The important thing is that the modem isn't there in terms of IP addresses. While it does crucial things with signals, it isn't really part of the networking topology as far as networks and routing are concerned. D-Link TM-G5240 802.11g wireless router, Cisco EZXS88W 8-port Ethernet switch, and MFJ-1278 multi-mode data controller. Small Internet access routers like this D-Link unit implement NAT. On its exterior port, the firewall is a DHCP client, and acts just like your PC did to get an IP connection to the world. Internally, the firewall does NAT and applies stateful packet filtering rules. On its interior side, the firewall is a DHCP server for a private IP address space used inside your organization. RFC 1918 specifies a set of private blocks of IP addresses. You could have up to 16,777,214 hosts on your internal network, if you used the 10.0.0.0/8 IP network. But you only need one external IP address. No one outside can tell anything about your internal topology. You could have lots of routers and networks inside. From the outside it appears that you have only one very busy host, the exterior port of the NAT firewall. Your internal addresses are not routable. The reserved RFC 1918 addresses are not routable. If an attacker managed to figure out your internal IP address, his packets would not go toward you but toward the core of the Internet. They would eventually hit a core router, one of the routers on the backbone. The core routers have no default routes, they have to know where everything is. And they don't have routes for 10/8, 172.16/12, or 192.168/16 — those networks effectively do not exist according to the routing tables of the public Internet. You can do this in multiple levels. 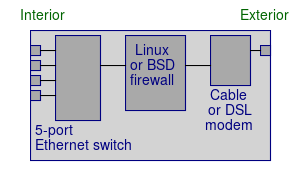 In the below diagram, a cable or FiOS or DSL router connects to the ISP's line. It gets a publicly routable external address, and this one is set up to use 192.168.0.0/24 on its internal side, both wired and wireless. Then a second router, one with an Ethernet port as its external connection, is connected to one of the other router's port. This inner router must be configured to use a different block of IP addresses for its DHCP clients on its interior side. Let's say you connect a computer to that inner network, to one of the wired Ethernet ports or the wireless net of the inner router. That computer gets an address like 192.168.1.0, and it is told to route its packets through a gateway at 192.168.1.254, which is the inner router itself. That inner router got an edge network address like 192.168.0.1 for its exterior (or "Internet" or "WAN") port, and it was told to route its packets through a gateway at 192.168.0.254, which is your edge router. It, in turn, was told to use 24.14.170.39 for its exterior port, and route its packets through 24.14.170.1. You can do some interesting things with multi-level NAT, even in a home setting. Because both of your routers perform NAT, of course the outside world can't connect in. That is, unless you use video chat or another application that opens a static tunnel inbound through your edge router. Put smart home devices on the inner network, and your computers on the edge network. Again, that protects poorly designed IoT (or Internet of Things) systems that you can neither patch nor configure to not open access to the outside world. If they open a static tunnel to expose themselves through the inner router, you can access them but the world can't. Yes, it works the same way with 128-bit IPv6 addresses, assuming your routers support it. If your edge router uses a cable modem, that device may break IPv6 by defaulting to a small MTU or maximum packet size. I have a page explaining how to use IPv6 on a cable modem. So what about that "telling lies" analogy? Make certain that your lie is plausible. The NAT device claims that all traffic is from/to its external port, which is a routable address. Above all, make certain that you are consistent in your lying. The NAT device keeps track of the multiple connections it is masquerading on behalf of internal hosts. If you care about the details: It uses unique source TCP ports, thus unique client sockets, for every masqueraded connection. So yes, to be pedantic, it is doing both NAT and PAT (Port Address Translation) simultaneously. Based on the destination port of the inbound packet, it can figure out which, if any, existing connection the packet belongs to. It can then change the TCP and IP headers accordingly before sent the packet across the interior LAN. The external socket (IP/port) maps onto an interior socket (IP/port) according to the current translation table. But what about UDP traffic, like DNS lookups, NTP clock synchronization, or even some audio streams? While there is no connection in the TCP sense, it also does the necessary tricks with UDP ports. How can I do this for free with a Linux machine? Run a shell script like the following at boot time to enable NAT. Make sure you get this right, it really matters where you use regular quote characters (ASCII 0x27, typically just to the left of the <Enter> key, at least on US keyboards) and where you use back-quote characters (ASCII 0x60, typically somewhere in the upper left region of the keyboard, at least on US keyboards). Also parenthesis (ASCII 0x28/0x29) versus curly braces (ASCII 0x7b/0x7d). # Figure out what the external IP address is. # This assumes that p7p1 is the external port. # Be aware of the modern network interface names. At the SIGGRAPH Conference in Los Angeles in 2005, we used one Linux host with a 2.3 GHz CPU to do address translation for the entire conference site. The Linux machine was handling over 9500 simultaneous network connections and its CPU was still something over 95% idle. We did this because a $15,000 Cisco router did not have the needed performance. Cisco routers are extremely good at routing, which can be done in hardware. NAT takes processing, and routers traditionally have not had very powerful CPUs. The last I heard, the Los Angeles Conference Center was looking into Linux. And, Cisco has moved away from slower Motorola CPUs to IA64 systems, basically PC motherboards. 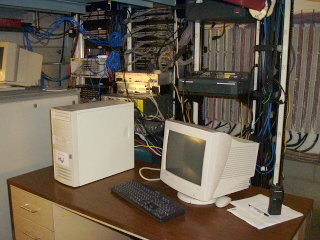 Linux machine running NAT at the Los Angeles Conference Center. Overworked Cisco routers in the background could not handle the load.